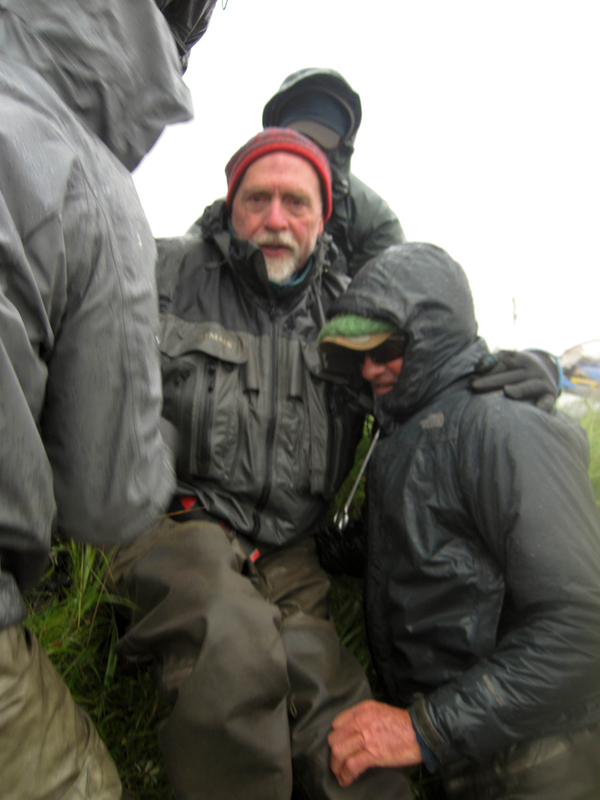 From the log of August 2, 2011: “Fog and drizzle which kept us pinned down in Dillingham yesterday cleared as we flew west… The portage went well. 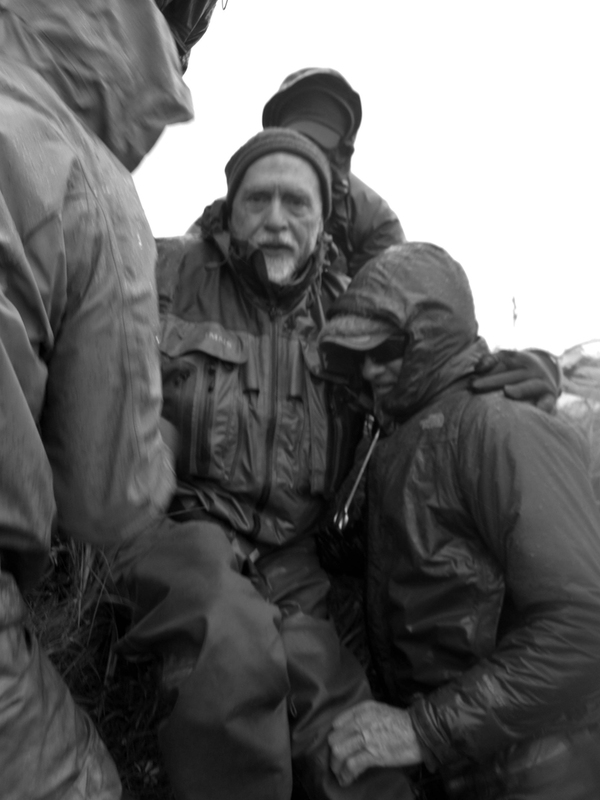 We portaged Bob Roark across the tundra in an inflated raft…. Dragging two rafts down the creek was about as good as it gets, which is to say no new injuries occurred and any old injuries that were aggravated were manageable. 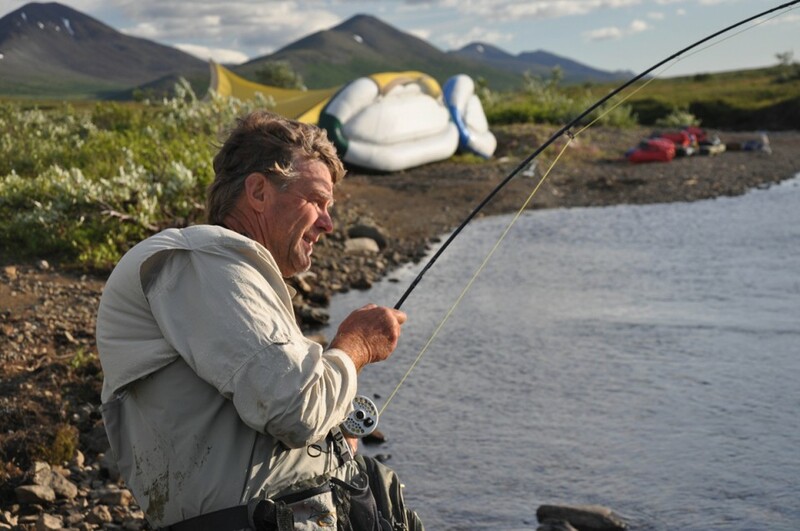 This particular portage is a somewhat more humbling experience for anglers in their sixth and seventh decade contrasted with younger athletes. The portage behind us… We made camp and strung up fly rods… Dolly Varden Char, Rainbow Trout, and King Salmon were taken and released. Barometer falling. Morning dawned on August 3’d with a quartet of Red Foxes scampering about like puppies on the cut-bank about 300 feet upstream of camp. 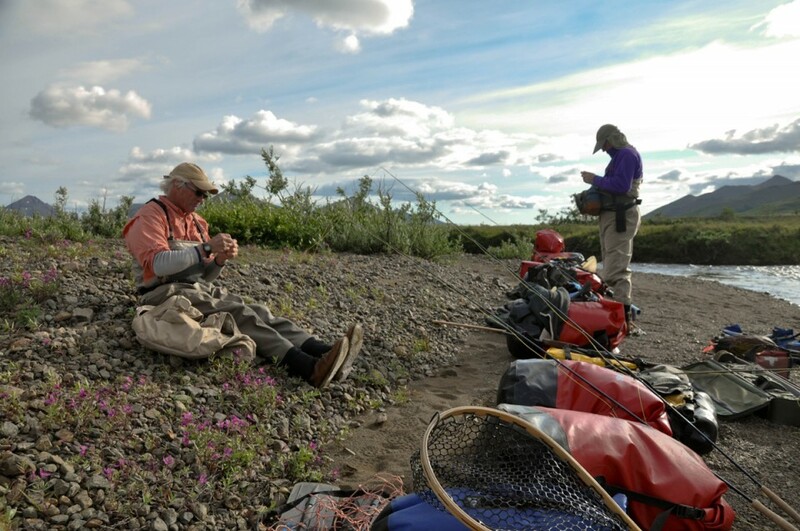 Chuck Ogilby flushed a Caribou from the willows near camp while fishing and then we shoved off to take advantage of a fine day for travel. 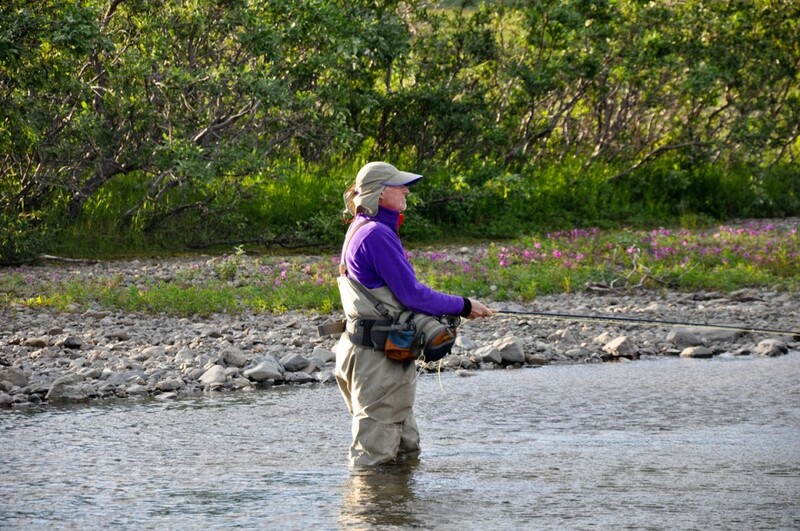 As we rowed, waded, and fished the guys discovered that Dolly Varden were in the upper river in good numbers. 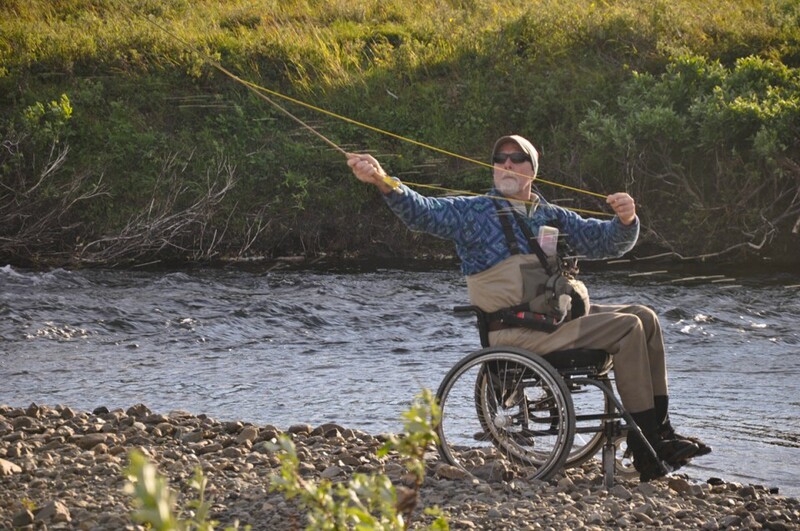 Bob hooked a large King in the pool below the Golden Eagle nest. 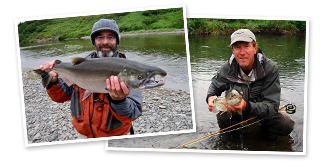 Sockeye and Chum, Grayling and Rainbow Trout made up the day’s species account. 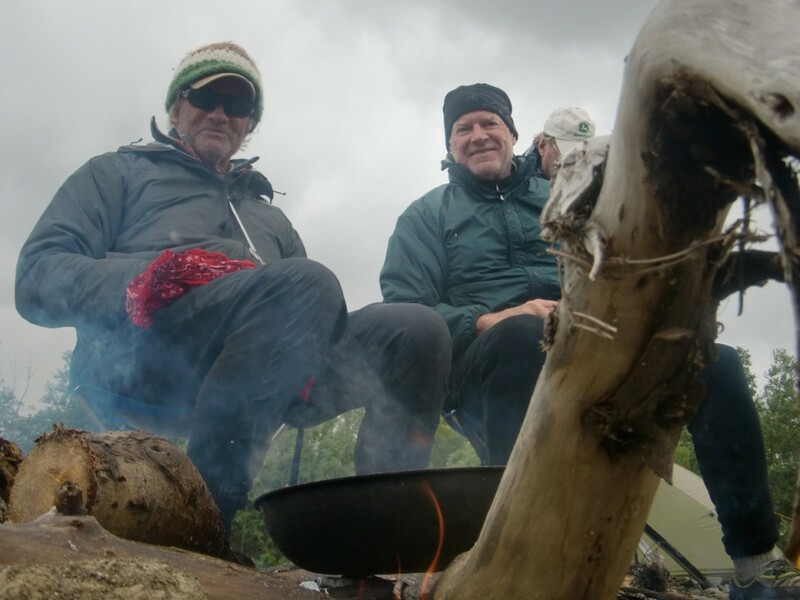 As I later reviewed the photos taken in the week and read the entries in the log, I was struck by how big a role the weather played in our experience. First it was fair weather and then it was not fair weather, though not wholly foul either. Photographs show blobs of water droplets that partially obscure the faces, the fish, and the landscape. It was a week that we often kept our hoods up and let it just blow by. It’s hard to overstate what a profound experience it is to travel with men who’ve spent several decades of their lives together. All those trail miles they’d covered, all the ski tracks they made, streams fished, avalanche chutes traversed, horse packing rodeos and the Rocky Mountain weather blowing through it all. 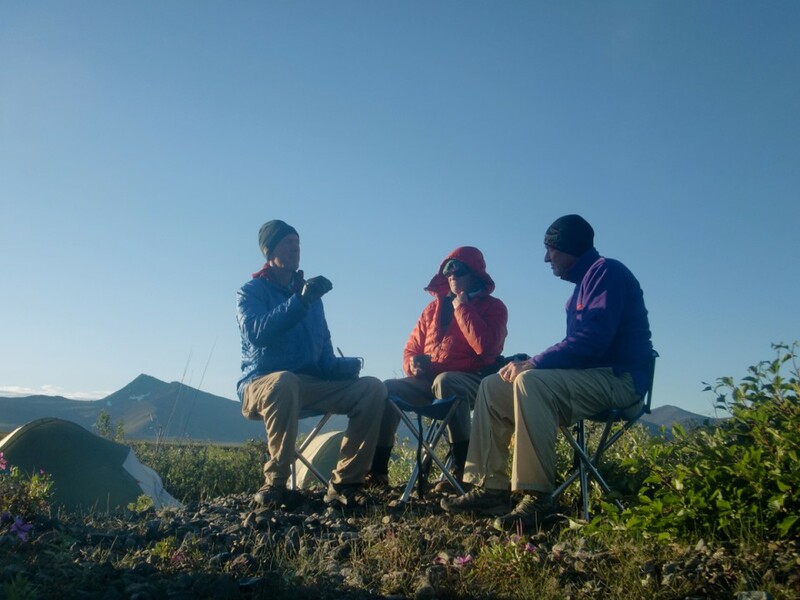 Here on a little known tundra river Ken Helfenbein, Dennis Donald, and Chuck Ogilby have come together to celebrate Bob Roark’s 60’Th birthday. This trip is Bob’s dream. 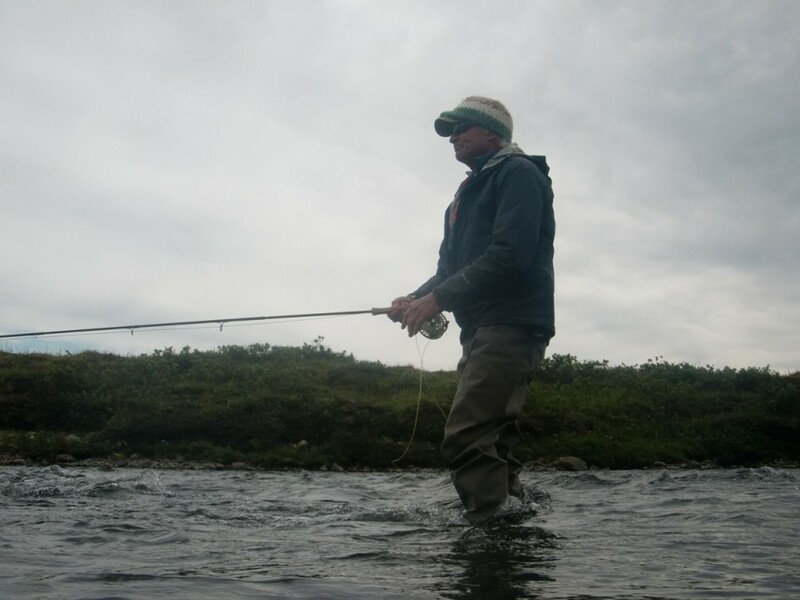 He wanted to float down river once more through the coastal mountains of Alaska to fish for Char, Trout, and with luck some early Coho Salmon. 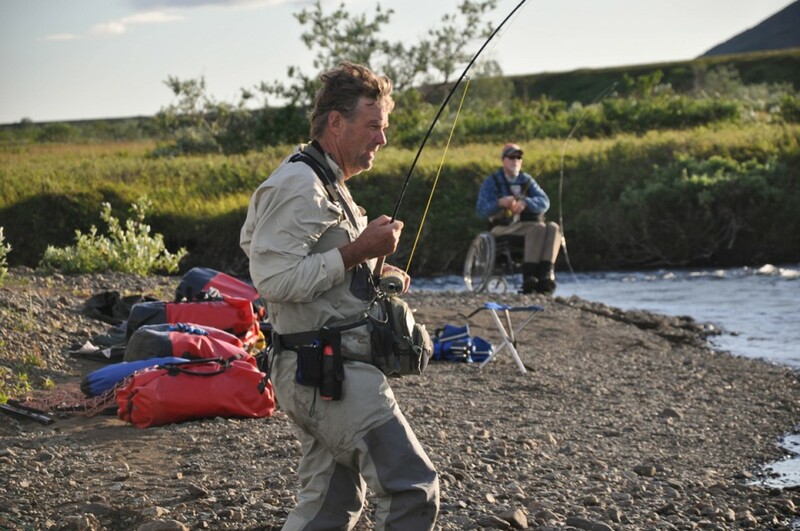 For three of these past decades Bob has been “in a chair,” a wheelchair, though that has not kept him from adventuring widely across the planet. What Bob told me was: he’s incredibly fortunate that his spinal chord injury was very low (T12-L1) allowing him to maintain a strong core and abdominals. 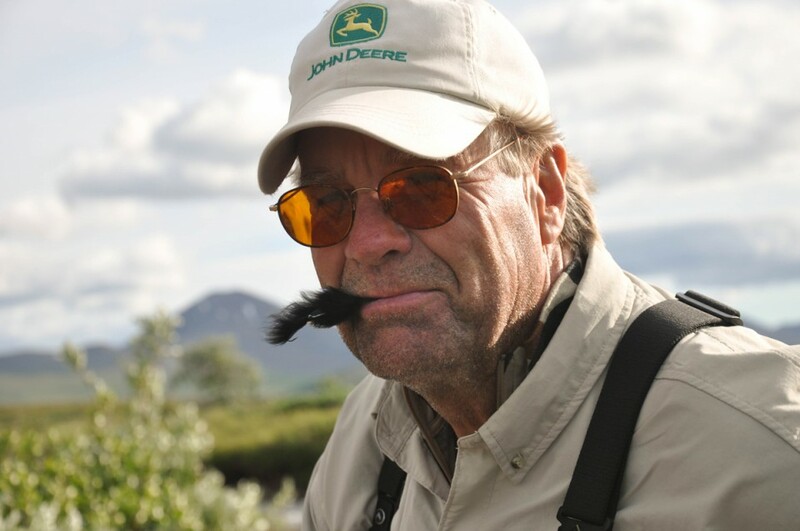 I knew from snippets of the birthday stories that he’d kayaked extensively down wild Arctic and African rivers as well as the Grand Canyon of the Colorado River, that he’d contracted malaria twice while practicing medicine in Africa, and that it’s tough to follow his tracks down through the Colorado Rockies on his mono-ski. 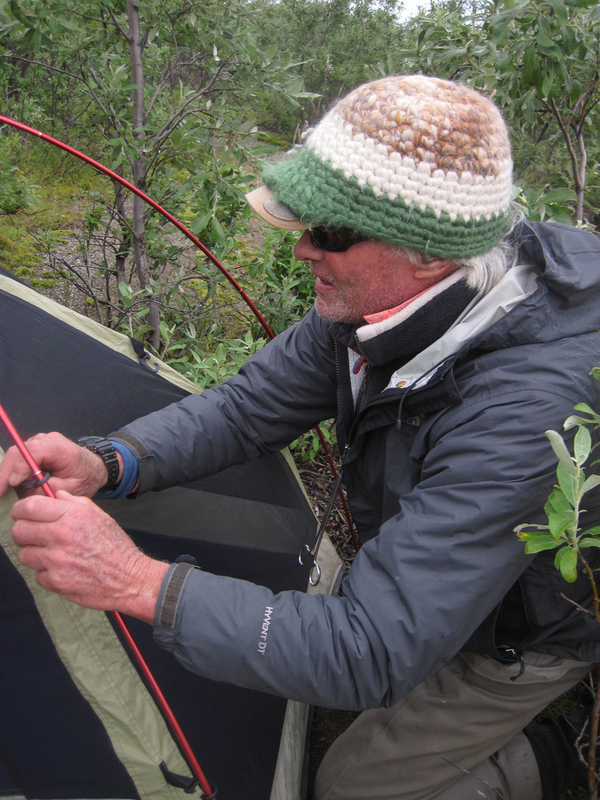 The men’s stories stretched back to early Tenth Mountain hut days in the Rockies and branched out across the globe. 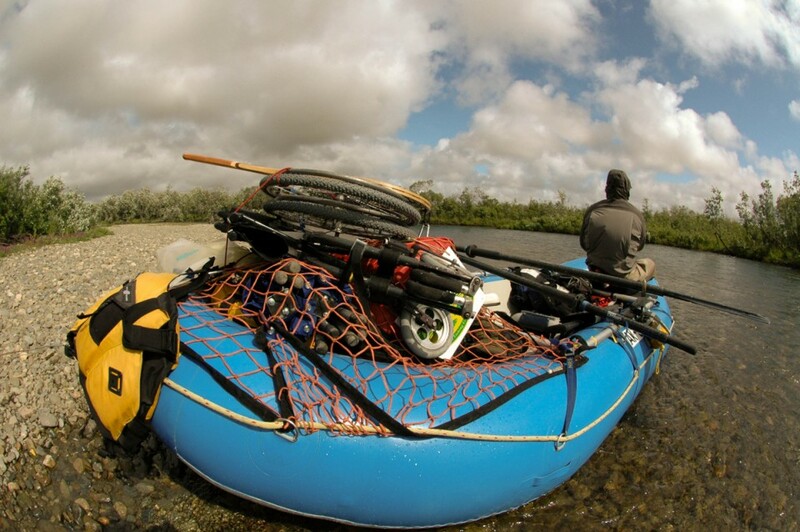 The raft passed through the tundra landscape, the wind blew across with nothing to stop it. 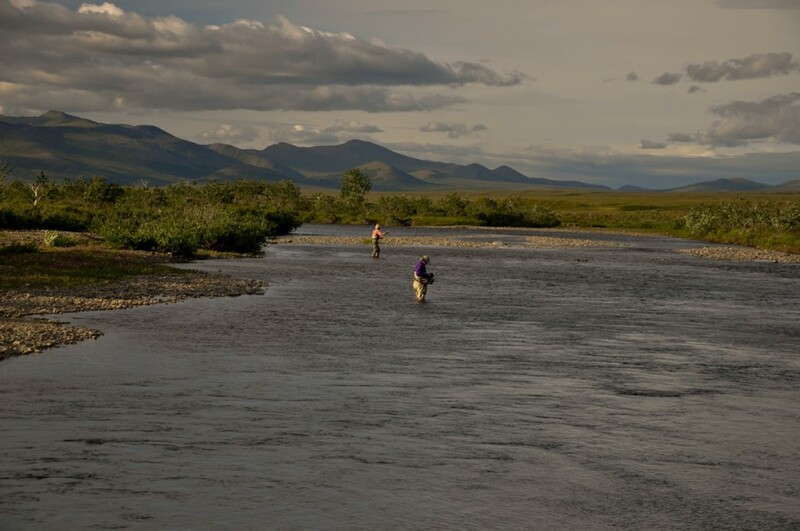 Out on the wide tundra they had time on their hands, fly rods, and friendships. 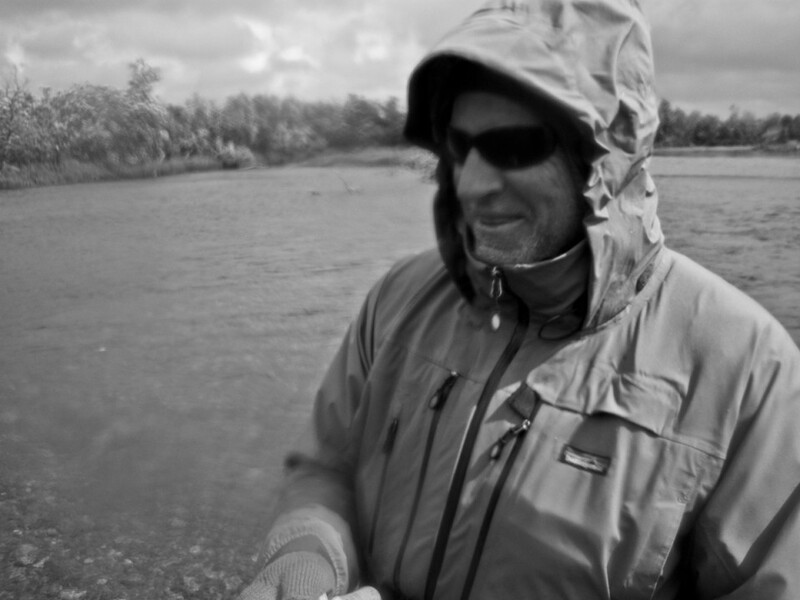 From the Log of August 4, 2011: Chuck hooked, played briefly, and lost the first Coho Salmon of the trip. Weighted streamers took Sockeye, Dolly’s, Rainbow, and Chum. We “made up” for the extra day that we’d laid over in Dillingham by going twice the planned mileage, nearly twenty miles. The weather was “not entirely unfavorable”. The wind was channeled by hilly terrain as we passed through the mountains. In the evening it rained quite hard. However campfire pizza has never tasted so good (followed with a splash of Merlot) as the pizza did that night. By the next morning the rains had passed and the weather was fair with no bugs and just a bit of a breeze. In the middle reach of the river just after exiting the coastal mountains the Char and Rainbow Trout fishing was quite good. 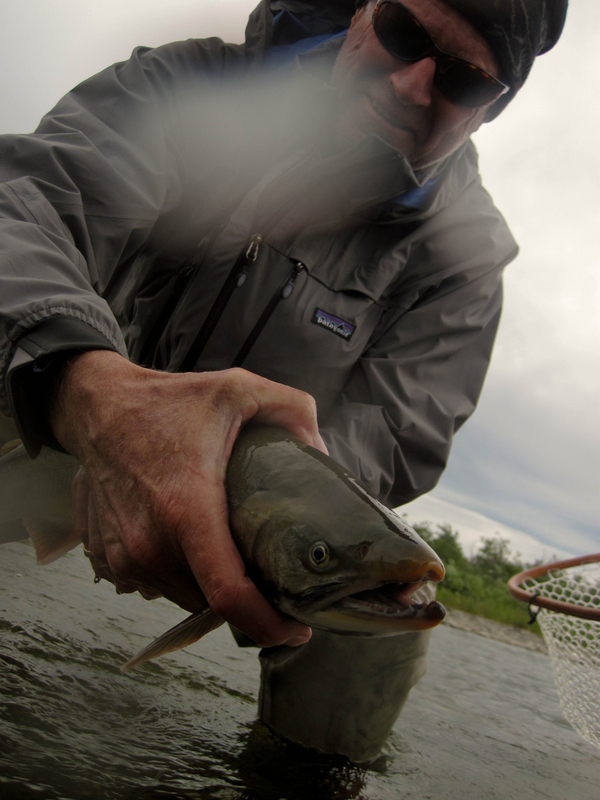 The larger Dolly Varden were morphing into their spawning colors. There were 20-22 inch fish with orange kypes, fins edged with creamy white, and pink spots against olive backs. Good numbers of smaller Char of 16 -18 inches were olive backed and silver sided with less distinct markings. One of the guys released a ten-pound King Salmon that was bright silver sided with a bronze back. A fine Coho was kept for sushi on that third night. The river gradient flattened as we travelled. Camp beaches changed over the week from being coarse boulders and cobble in the mountains, to pea gravel in the middle reach, to sand and silt in the oxbow meanders. At dinner I asked the guys to report the numbers of fish caught and released for the record. They were overwhelmed by the demand and managed to weasel out of quantifying the experience, by using terms like “oodles of Rainbow and gobs of Char”. Everyone caught Coho, but they were not “easy Coho”. Those would come tomorrow. 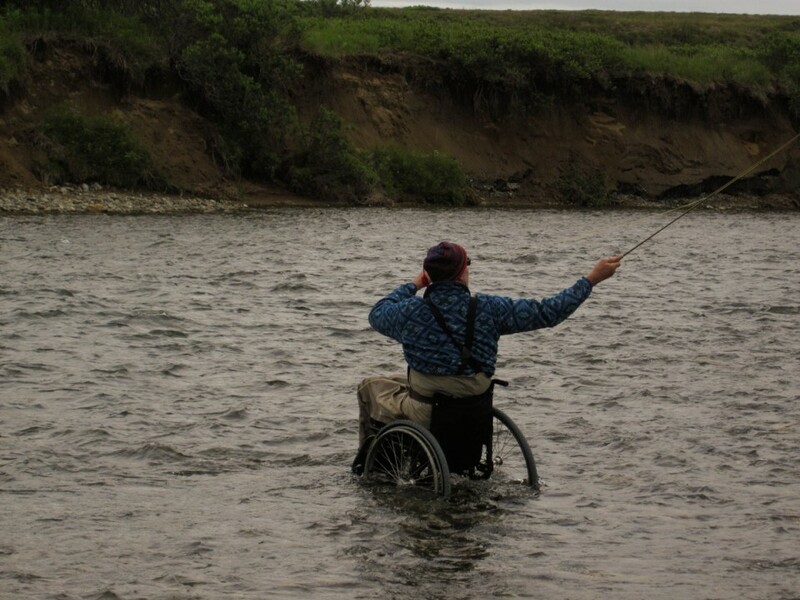 There were lot’s of casts between salmon takes, deep slow swings, with more wading, and repositioning the boat, and then casting again. It massively understates the case to say that those Coho so fresh from the sea were great fun. 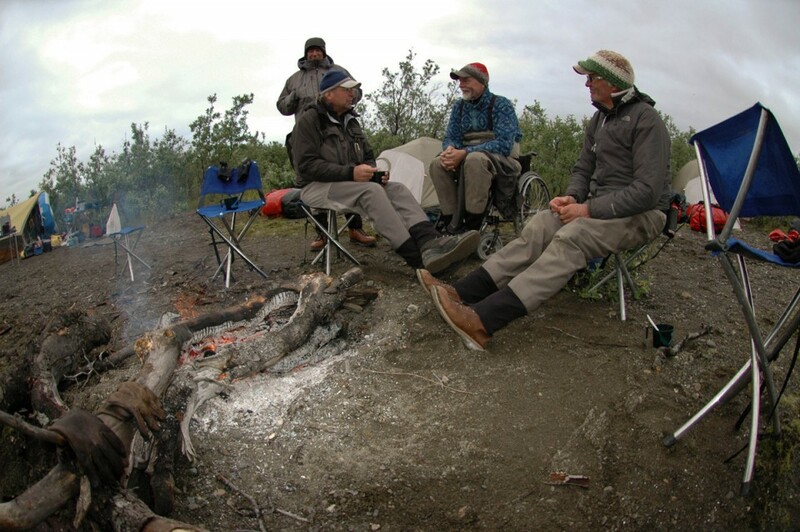 That evening as small flocks of white fronted geese traded across the horizon we shared a campfire with a party of anglers whose camp we’d passed by on August 3’d. They recounted a horrific experience. They’d originally planned to be dropped at a different river but the weather prevented that. So they chose to work it out as best they could, without maps, on this unfamiliar river! At some point on day three they made an incorrect channel choice, which sent them down a narrow side-channel for many miles. Those miles stretched into two long days. They rowed among beaver sloughs and barely navigable flowages. 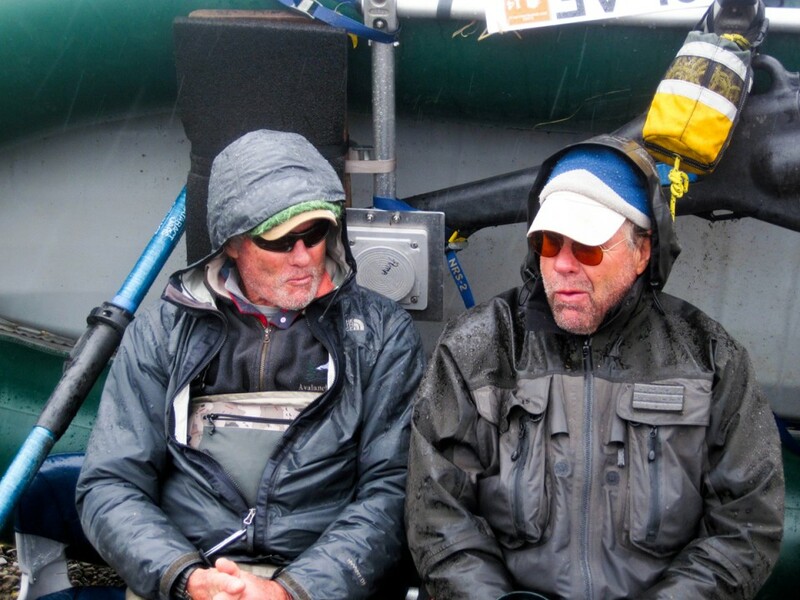 The scuddy weather, the presence of Brown bears, and the experience of being lost without maps was awful. However they’d made it out in good health to tell a story with a fine ending. 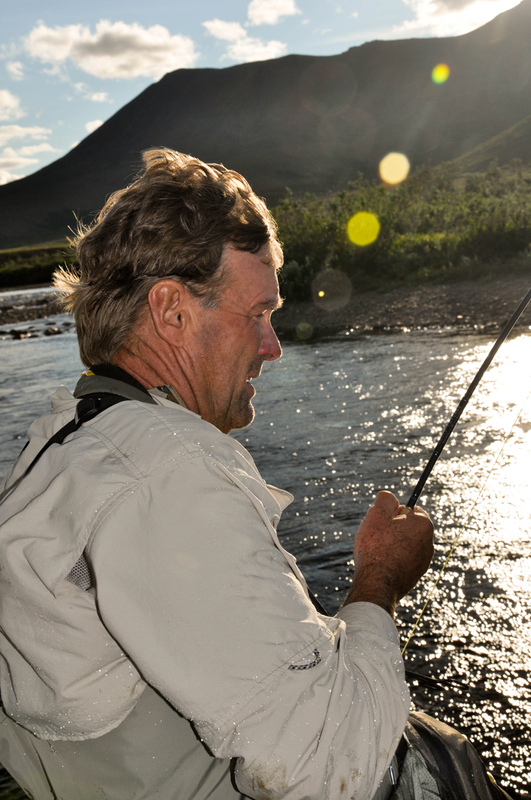 That evening more fish were hooked in the low angle twilight and a dram of rum shared between the two groups. We were all happy to be alive along a river full of fish. We rafted the final miles. 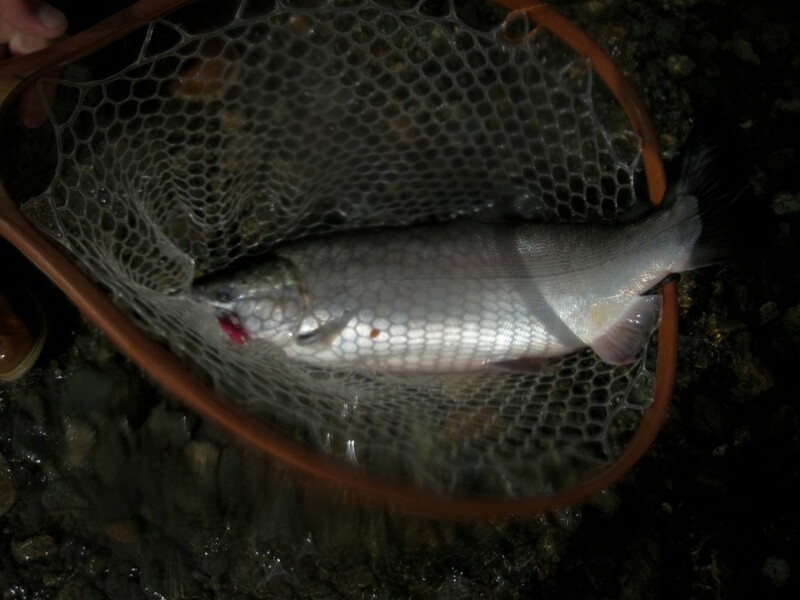 Coho were taken and released. 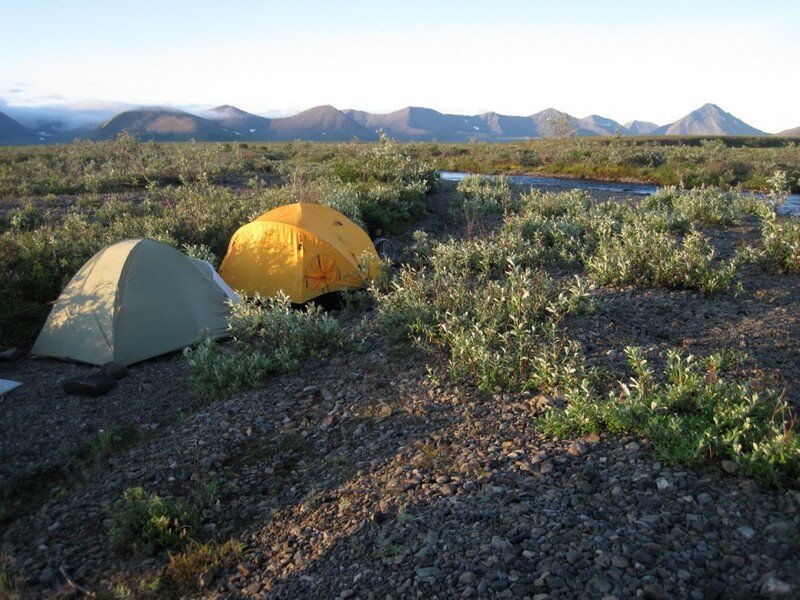 A final camp was made and then broken early in the morning. 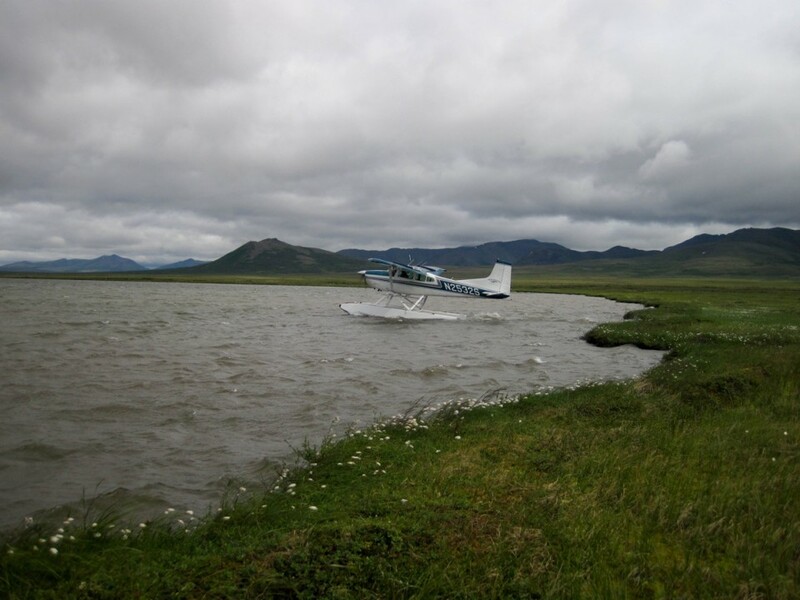 The river meandered broadly across the estuary before arriving at the Bering Sea. Some Sandhill Cranes and shore birds traded across the low flat horizon. It seems entirely appropriate that since this was a trip with Bob Roark that there was a challenging portage to the “pick up spot” on the beach. Chuck and Ken, with Dennis and Bob broke yet another trail together.